Dividing the city of Berlin cleanly in two, the Berlin Wall was an imposing structure (156 km long and 3-4 meters high) that demarcated the border between Western Europe and the Eastern Bloc within Berlin. Under the terms of the Potsdam Agreement and the London Protocol of 1944, the victors of World War II (Britain, France, the US and the USSR) split Germany into four occupation zones. Berlin, the German capital, was an enclave inside of the Soviet zone, and it too was divided into four occupation zones. Eventually, the British, French and US sectors were unified into a single western zone. In August 1961, frustrated by a decade of emigrational brain drain, the leadership in East Germany and the Kremlin decided to construct a barrier to stop Germans from leaving East Berlin (while publicly stating that the wall’s purpose was to prevent western aggression; the East German government officially termed the wall “The Anti-Fascist Protection Rampart”). The hastily erected wall heightened East-West tensions and separated many from their loved ones. It also made stark the differences between West and East: one free, the other under rigid Soviet control; one prosperous, the other, not so. 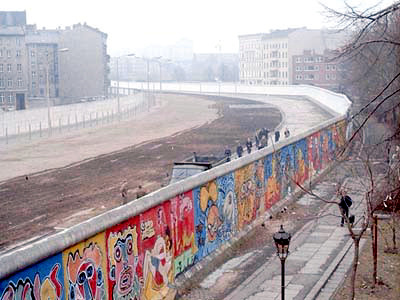 The wall became the most visible landmark of the Cold War. Visible, indeed, from outer space. What did Reagan say, exactly? Standing before the Brandenburg Gate, every man is a German, separated from his fellow men. Every man is a Berliner, forced to look upon a scar. As long as the gate is closed, as long as this scar of a wall is permitted to stand, it is not the German question alone that remains open, but the question of freedom for all mankind. Yet I do not come here to lament. For I find in Berlin a message of hope, even in the shadow of this wall, a message of triumph. In the 1950s, Khrushchev predicted: "We will bury you." ... [Yet] even today the Soviet Union still cannot feed itself. After these four decades, then, there stands before the entire world one great and inescapable conclusion: Freedom leads to prosperity. Freedom replaces the ancient hatreds among the nations with comity and peace. Freedom is the victor. And now the Soviets themselves may, in a limited way, be coming to understand the importance of freedom. We hear much from Moscow about a new policy of reform and openness.... Are these the beginnings of profound changes in the Soviet state? Or are they token gestures, intended to raise false hopes in the West, or to strengthen the Soviet system without changing it? We welcome change and openness; for we believe that freedom and security go together, that the advance of human liberty can only strengthen the cause of world peace. There is one sign the Soviets can make that would be unmistakable, that would advance dramatically the cause of freedom and peace. How was Reagan’s speech received? That depends. Reagan knew that his direct challenge to Gorbachev would anger some in his administration, but he issued it anyway, saying that it was “the right thing to do”. Many thought the speech rather dramatic, especially since it seemed unlikely that the wall would actually come down. For their part, the Soviets thought the speech was “openly provocative, war-mongering,” while Gorbachev himself said, “We were not impressed. We knew that Mr. Reagan’s original profession was actor.” Erich Honecker, then the leader of East Germany, was probably the most offended by Reagan’s words. By directing the call to tear down the wall towards Gorbachev and not Honecker, Reagan inadvertently highlighted how East Germany could only exist through support from the Kremlin. Besides, since the wall was in Germany, Honecker felt it should be his decision, not Gorbachev’s. What eventually brought the wall down? In the evening on November 9, 1989, an East German Communist Party official, Günter Schabowski, held a live press conference. He announced that every citizen of East Germany would be allowed a passport and granted visas to travel anywhere they wanted. A reporter then asked Schabowski when this policy would become effective. Taken aback by the unexpected question, Schabowski hesitantly said, “Now.” Soon, masses of East Germans flooded to the wall, demanding to be let through. Confusion reigned. One checkpoint was finally opened, allowing people to enter West Berlin for the first time in nearly 30 years. Just weeks before, Gorbachev had rejected the Brezhnev Doctrine (whereby the Soviet Union was compelled to intervene or invade its satellite states if they were under an existential threat). When the people of East Berlin stormed the wall, the Kremlin – according to what was later termed the Sinatra Doctrine (a reference to Frank Sinatra’s song My Way) – decided to let the East German government sort out the problem themselves. In the end, the people of Berlin got their way. The wall was taken down in bits and pieces by the very citizens of Berlin, both East and West, who had grown up and lived in its shadow. Today, only a tile border remains to mark where the Berlin Wall once stood.